At Desautels, we’re committed to investing in fundraising campaigns as well as building self-funded and profitable educational programs to support our mission, vision and strategic priorities. The McGill Executive Institute takes Desautels pedagogy directly into organizations and businesses to impact its leadership and create economic value. The programs bring an interactive process to bear on live issues, then uses follow-up initiatives to ensure that the learnings are transferable to the workplace. As the Institute celebrates its 60th anniversary, it continues to be a major contributor to Desautels. That means fiscal support for new hires, research grants, student activities, and seed capital for new programs and other initiatives. In 2016-17, MEI offered several new custom programs in Canada, the U.S., Europe, and Africa, as well as new public leadership programs in Retailing and Analytics. 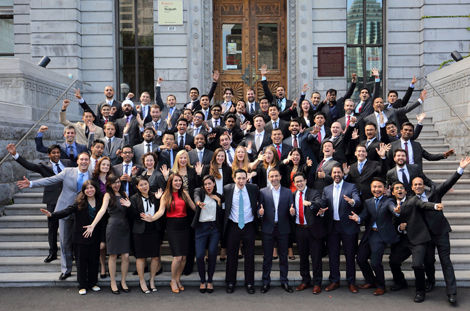 Also, the McGill Mini-MBA is now the largest executive program in Canada, and is growing at a double-digit rate. Self-funded degree programs help us advance our strategic priority of financial sustainability. Within our portfolio of self-funded programs is our integrated MBA and newly-introduced Masters of Management in Finance (MMF)—each responding to the changing needs of today’s business world. 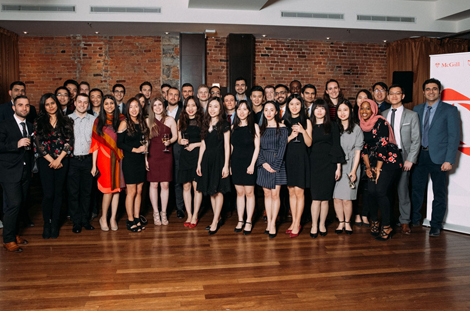 Photos: (Left) Desautels MBA program ranked #1 in Canada by Financial Times in January 2018; (Right) second cohort of MMF students celebrated the completion of their coursework & upcoming convocation in May 2018.